Tonight I wanted some stir fry vegetables that would compliment Kung Pao Chicken and Chinese Chow Mein – this was perfect! 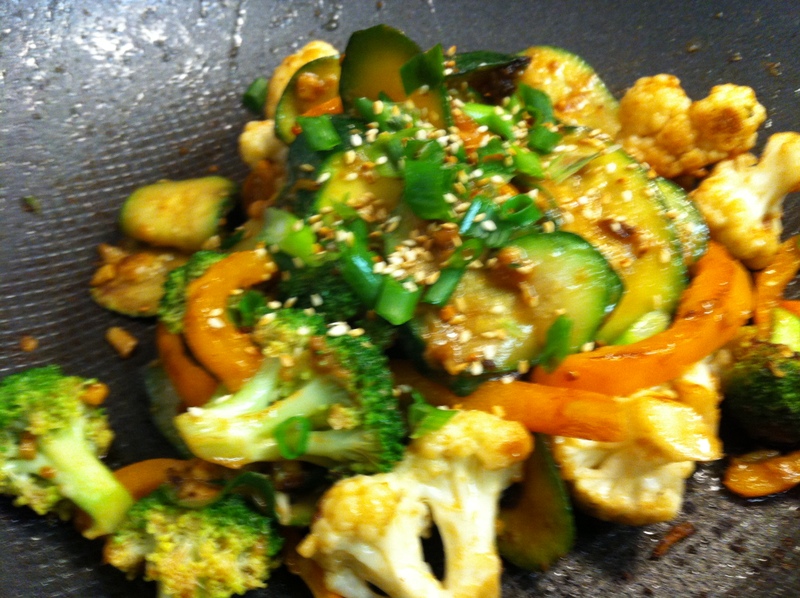 Feel free to try out different vegetables, and even add a protein if you like – let me know what you think. Stir fry vegetables lightly, just enough to give them a bit of carmelization in spots – then add a wee bit of water to allow them to steam a bit. Pour sauce in, and toss with vegetables just until they are crunchy cooked and well coated. Top with freshly sliced scallions and toasted sesame seeds. If you want to kick up the heat a notch, and haven’t overwhelmed your taste buds with a bunch of other peppers in other parts of your meal I recommend adding a tsp or so of chile flakes … yum yum yum. This entry was posted in Asian, Chinese, Recipes and tagged chinese, peanut, sesame, side dishes, stir fry, vegetarian by Chatty Kathy. Bookmark the permalink.